Crop Report: First of 2019! Officially it is spring but Mother Nature is thinking otherwise. Just the other morning we had a little frost on the puddles and scattered snow showers on and off. But all in all the ground is starting to firm up and the mud is going away (thank goodness). With any kind of luck we can start to get out in the fields next week and get a few early crops planted. This week we officially wrapped up the greenhouse expansion project. Hard to believe when I first started vegetable farming my greenhouse was a whopping 10 x 16 feet. Then in 2004 we added on another 12 feet. That little greenhouse raised plants, dried onions, cured sweet potatoes, and stored odds and ends in the off season. The last few years we have raised plants in the high tunnel by the barn but it wasn’t ideal. So this spring we tore down our little greenhouse to make way for a 20 x 36 foot greenhouse. It was a fun project and a nice change of pace. Last Friday we moved in onion plants and now its almost full (maybe it should have been bigger?) Peppers, tomatoes, and eggplant are off to a great start. Pretty soon we will be starting zucchini, cucumbers, melons, and a few flowers for our girls. We started a little bit of machinery maintenance on the mulch layer. Plastic mulch is a very helpful tool for us for many reasons. It helps to warm the soil in the spring, keeps the weeds away, and makes it possible for drip irrigation. The plow points on the front were pretty worn out. I was able to get a new set at the farm supply store in Penn Yan (another story someday). I cut the old ones off and got the shiny new on, greased her up and now she’s ready to roll. On the rainy days I can chip away at the rest of the fleet. Garlic is well on its way already. They look like little soldiers standing in a row. Garlic is a great crop to make you feel good. Always the first out of the ground. It can get snowed on, froze, and rained on but it doesn’t care, just keeps growing. The meat chicken business is in full swing. We are butchering the first batch of spring next week and then starting the beginning of May we will have fresh every week until fall. We get chicks every other week and right now we have three groups going. It’s amazing how they grow so fast! But did you know that post office ships the baby chicks? They come from a hatchery in Pennsylvania that ships them Tuesday and we usually get them the next day. But you should see the looks on peoples faces when you have these noisy boxes of chicks! We are hoping to get some of our direct seed crops in the field next week. Peas, radishes, and carrots are the first guys to be seeded outside. They don’t mind the cooler soil temperature. We also have a whole bunch of transplants to squeeze into the high tunnel and caterpillar tunnel. Bok choi, kale, chard, beets, broccoli rabe, and scallions will be the first transplants of the season. I’m sure they won’t all fit inside and the rest will be transplanted outside. We use the tunnels to get a jump on the season and have more variety on the tables at the market. Next to follow are potatoes and onions but they will have to wait until the following week. Still have time to sign up for the Summer CSA and we are very excited about the new Victor pickup location. Check us out at the markets Rochester Public, Saturday and Brighton, Sunday. One of the things that we like about these videos is they serve as little benchmarks in our lives and work as marketing tools as well. We’re proud of our work and we love what we do every day. These videos and the pictures that we share on our social media and our website reflect our love of our farm, our family, and the relationships we have with our customers and friends. We feel very lucky to have so many great things in our life! We look forward to making more videos and posting more great material on our website and our social media sites. This video was shot by John Altobello and his drone. He happened to catch this scene with Phil and the kids without any planning. It was a beautiful day. You couldn’t have paid for better weather. Shot at the public market in early March. Just a quick sample of what we bring with us to a typical winter market. We are very excited to have the good weather back soon so we can start bringing more! This was also shot by John Altobello on the same day. We wanted to make a series of smaller videos that showed people what our farm and fields look like. It’s always nice to know where your food comes from! We have some plans to do some more coming up this spring and summer but we have to wait until the weather turns. Luckily it looks like this week we will see some 50’s and even 60’s so that should be enough to allow us back out on the fields. Thanks for watching and stay tuned! It’s somewhat of a personal Farmer’s Almanac. We send out crop reports on our email blasts to alert our friends and customers of what’s happening in the field. If you have a CSA with us or if you frequent our table at the markets we attend then you’ll want to know what to expect as the summer months progress. Looking back to last year is fun too. This last week of really cold temperatures is enough to make you want to run south. But looking at these old crop reports made us realize that spring is coming soon! Not only that but the sun has been much warmer this last week than it has in months. It’s coming but it seems like it’s taking forever. Here’s a few crop reports that we put on our blog from last year. Here’s a few that might be interesting to you and of course, get you a bit excited for this year’s growing season. We can’t wait! These three are from July of last year. It will give you an idea of what to look forward to, especially if this is your first CSA with us! If this is the first time you’re hearing about us or you stumbled upon this blog posting check out this link of where to come find us. Come meet us at one of the markets we attend. The fast approaching spring can’t come soon enough for many of us. But maybe these crop reports are more than just teasers. They really are time capsules into years past. We now have the internet and this web blog to thank for them being public, but this is nothing new for farmers and nothing new for a lot of us who have kept journals and diaries. Enjoy this video of our farm and family! People often ask “What does CSA stand for”? The answer is Community Supported Agriculture. But what does that mean? In a nutshell it means you buy a share from a local farmer and for a set number of weeks you receive produce in return each week. Our farm is very unique in that we offer 100 percent choice. We have never offered a box share and want the member to pick what they like. Nothing is more frustrating to get a box of produce and have no idea what half the things are that you received. I thought I would highlight a few benefits of joining our CSA for the consumer and the different benefits for the farmer too. You’ll receive fresh vegetables for 20 weeks during the peak of the growing season. Starting in June you can enjoy some of the first greens of the season and the first juicy strawberries. Every week there is always something new on the table. Then towards the end of summer the fall produce starts coming in (my favorite time of the year) and who doesn’t love broccoli, cauliflower, fennel, sweet potatoes, brussel sprouts, and more. Your also making a commitment to eat healthier. Now that you have all these fresh veggies available every week you can enjoy them every day. Everyone knows that the flavor and freshness speaks for itself. Maybe you’ll explore new recipes and impress your family with new culinary skills. Everyone needs to slow down and enjoy more home cooked meals with family and friends and less processed foods. You can fill your freezer with all the extra produce that you can’t get through. Maybe your going on vacation and won’t be around to cook all of your veggies. Easy! Take a few hours to freeze or can some of your share. Many things don’t require much effort to freeze. Such a peppers for example. Just cut them up, bag them, and put in the freezer. Maybe you cook the whole quart of green beans and eat half for dinner and freeze the rest. Now you’re spreading the value of the share out throughout the whole year. Buy paying up front for your share you are getting 20 weeks of vegetables at a discounted rate. Each week your paying less than the table price that the retail customers are paying. Who doesn’t like a saving money! Now that you have bought a share you have your own farm. You will have a better understanding of the seasonality of produce. You can ask the farmer questions of how the food is grown or what variety it is. Maybe even ask questions on how to prepare something. You can brag to your friends of your “farm” and tell them what they are missing. By selling shares in the spring it really helps out with early season cash flow. Springtime is an expensive time of the year and having that extra cash flow really helps. Many inputs are needed to be paid for before we can even turn a wheel. Seeds, fertilizer, plants, propane, diesel, and more are needed to get the season going. 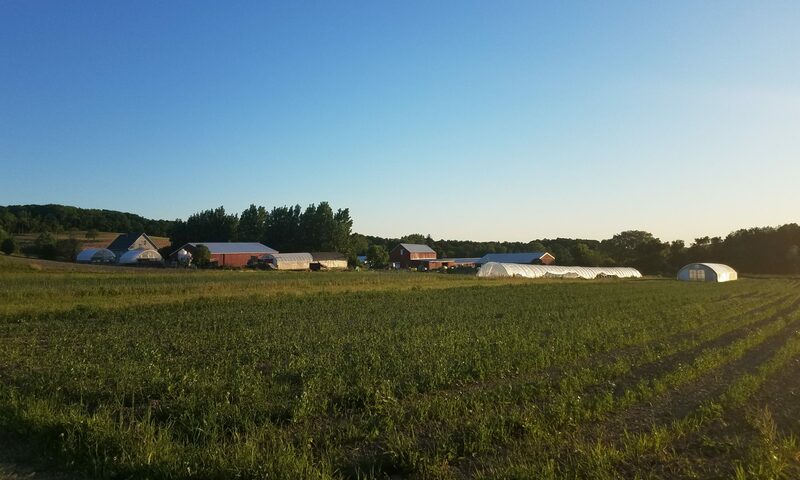 We can add staff earlier in the season to help with greenhouse work, field work, and general labor. Each share represents guaranteed sales during the summer season. It’s incredibly helpful to know how much to grow and what to bring to market. At the farmers market you can never really predict what sales will be like. It can be too hot, rainy, or a holiday weekend and it all can impact sales. But by having pre-sold shares it takes the highs and lows out of each week. We can build a relationship. We’re going to see you each week. We can meet your family and learn names. Talk about what you did with your share last week and learn new recipes from each other. This is our favorite part. The personal touch that a CSA adds gives the Community part a deep meaning. The CSA is part of a diverse marketing program for our farm. If we depend on the farmers market for 100 percent of farm sales that would be pretty risky. More channels we have the better and a CSA program plays a big part in that. By having farmers markets, a CSA program, restaurants, and wholesale we can market all the produce we grow. I hope that this gives a better understanding on all the benefits of CSA. It’s a great program that works so well for many families. We have many families that have been members for many years and just love it. If your on the fence please stop by the market some time and we can chat.